TULSA, Okla. -- An Oklahoma teenager convicted in the fatal stabbings of five family members is set for sentencing Thursday, when jurors will consider whether he should spend the rest of his life behind bars. 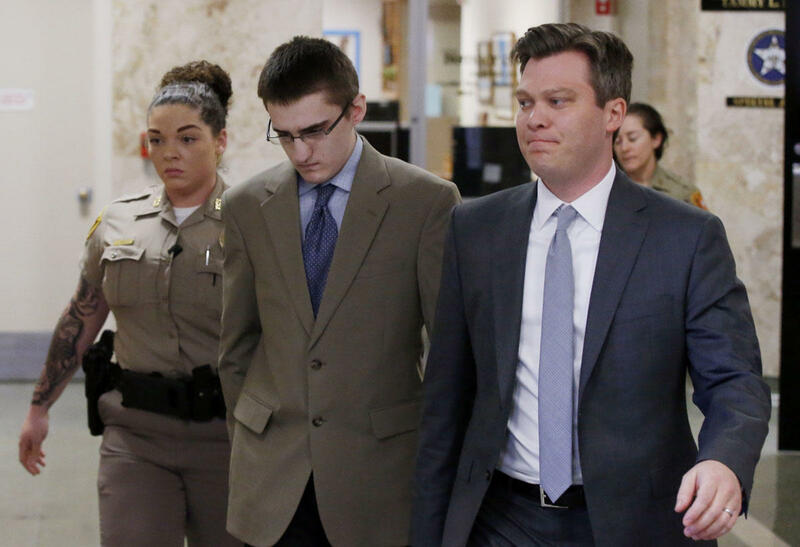 Michael Bever was 16 when he and his then-18-year-old brother, Robert Bever, killed their parents and three younger siblings in the Tulsa suburb of Broken Arrow, prosecutors said. The older brother pleaded guilty in 2016 and a jury convicted Michael Bever late Wednesday of five counts of first-degree murder and one count of assault and battery with intent to kill. "They punched a knife into their sister's neck," District Attorney Steve Kunzweiler said. "They then went and attacked their mom, gave her 40-some-odd wounds to her body. They then hunted down their dad and stabbed him in a bedroom. And then they had the audacity to go and knock on a door to try to lure out those children so they can stab them, so that they can go on some kind of cross-country crime spree. "I want to know: When do you want them out? When do you want them as your next-door neighbor?" The jury will hear evidence from prosecutors and defense attorneys Thursday before recommending a sentence of life in prison, either with or without parole. Defense attorneys argued that Michael Bever, now 19, was led astray by his older brother, and Robert Bever testified that he wanted to take responsibility for all of the killings. Robert Bever has already pleaded guilty and will spend his life in prison. The younger brother's attorney, Corbin Brewster, said after the verdict that he will urge the jury to sentence Michael Bever to life with the possibility of parole. He said his client was "stunned" by the verdict. "The light at the end of the tunnel for Michael Bever is the most important thing that I can fight for at this point," Brewster said. "The jury has spoken. This is all we have left to fight for, for him. And we're going to give it our best shot." But prosecutors said Michael Bever should be locked up for life because he was a willing participant in the gruesome killings of his family as well as the attack on a sister, now 16, who survived. The parents David Bever, 52, and April Bever, 44, and their siblings, Daniel Bever, 12; Christopher Bever, 7; and Victoria Bever, 5, were all killed. A toddler in the home wasn't injured. Detectives who testified in 2016 the brothers detailed to officers a gruesome plot to carry out further mass killings across the country after killing their family. Detective Eric Bentz of the Broken Arrow Police Department said Robert Bever expressed a desire for notoriety for being a serial killer. Bentz said at the hearing the teen told of a plan to kill their family, cut up the bodies, and store them in bins in the attic before heading west in the family SUV armed with guns, ammunition and makeshift bombs to randomly attack other locations and kill 10 people at each place. Brewster argued that it was Robert Bever, not Michael, who was behind the attack. "What happened in that home was horrible. We don't dispute that," Brewster said. "Michael Bever is honestly a gentle young man who was misled by a mentally ill older brother, and there's a lot more layers to him as a human being than just what happened back in 2015."